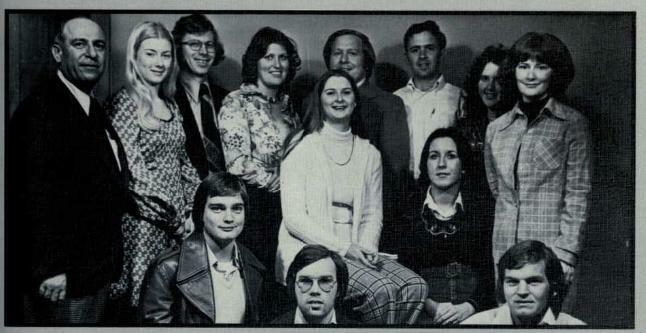 do you recognize anyone in this photo from 1976? Row 3: Dr Hassan Abul-Hadi, Debbie Brust, Dr Jerry Miley, Pat Moore, Billy T Lindsey, Gregg Sutherland, Denise Watts, and ME. I am sure that Hadi had his doctorate because we always referred to him as Dr Hadi. Dr Hadi’s wife was my daughter’s fifth grade teacher; she was a lovely lady and an excellent teacher. Dr Hadi stated to the class that he had to go back to Palestine to arrange his sister’s wedding (I presume his Dad was deceased). I asked him did his sister get to arrange his wedding. He evaded the question. Dr. Miley was a soft-spoken guy and my thoughts of him was that he was a very nice man. Billy T Lindsey’s wife taught at Colbert Heights Elementary. He earned a doctorate after this class. I was shocked to see him as part of gospel quartet when I attended a 4th of July or Labor Day event at Spring Park. He was the lead singer and his voice rivaled Pavarotti, in my humble opinion. His group reminded me of the gospel groups that my grandmother loved so much when I was a child. Could someone post the name of his gospel group? Dr Lindsey was a really nice man and good Professor. There were a small group of prima donnas in one class that chose to come in late and sit in the far corner away from the rest of the class. Dr Lindsey asked them to move into the class group, but they just sat there and looked stupid. He suggested it several times and one of the girls asked WHY? And Dr Lindsey said because I am the teacher and I am telling you to, that is why. That was the first time I had ever seen students rude to someone who was the keeper of their grades. Smart girls.